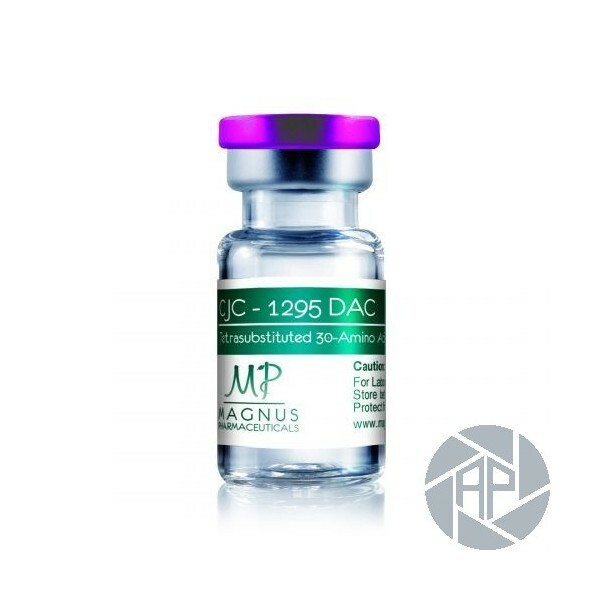 CJC-1295 DAC, also known as growth hormone releasing factor (GRF MOD (1-29) or GRF), is an analogue of GHRH (growth hormone releasing hormone). 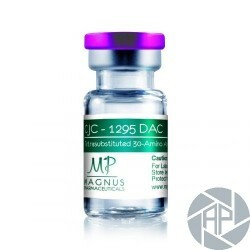 CJC-1295 DAC stimulates HGH, and its interaction with GHRH in the body produces a "family" growth hormone (GHR no other peptides will not produce such a wide spectrum of growth hormones such as CJC-1295). Very valuable and unique characteristics of CJC-1295 is that it can affect an increase in the amount of secretory cells and the pituitary growth hormone, which can produce. The difference between the CJC-1295 and CJC-1295 DAC is that the CJC-1295 DAC is version CJC-1295 with the addition of so-called. Drug Affinity Complex (DAC), which significantly prolong their effects and action. This means that the product will act in the body much longer than is usual in CJC-1295 (without DAC), particularly up to 14 days! Simultaneously, CJC-1295 DAC does not have such a steep ramp (rapid increase HGH levels) as CJC-1295, but it will cause a smoother and more uniform increase HGH levels. Clinical tests it has been found that after one injection of CJC-1295 DAC will increase growth hormone in the blood plasma from 3 to 10 times for 6 days, and increased IGF-1 concentration of 1.5-3 times for 9-12 days! Because of the long half-life and stable even the effects of the CJC-1295 DAC in fitness and bodybuilding getting more and more popular. The optimal dose of CJC-1295 DAC is 1000 to 4000 mcg per week (3-4 evenly distributed dose). CJC-1295 DAC is not suitable to separate solo use, and is often combined with the GHRP-6, GHRP-2 or Hexarelinom Ipamorelinom to achieve a synergistic effect which significantly increases the amount of growth hormone (HGH). Based on the user experience is the most popular combinations of CJC-1295 DAC with GHRP-2 and GHRP-6, and ginseng, which is one of the most to gain muscle mass. Many athletes after this treatment experienced a mean weight increase of 6-9 kg of muscle mass over a period of 6-8 weeks, and the current increase in strength and performance by about 20%. Also old injuries of joints and ligaments stop hurting, and there was also their gain.